Would you hike 9.2 miles to see a view like this? Seven trekkers made it up the Stephens Trail to the Massanutten Trail with the final push up Kennedy Peak and tower to witness this amazing 360 degree view. The morning began with the two hike leaders meeting two sets of car pools - Marit Anderson (leader) coming from Rockfish Gap with Barbara Martin, Jackie Bradley, and Scott Davis and Michael Seth (leader) joined by David Bennick from Harrisonburg/Elkton. Dave Borszich met us at our rendezvous - Camp Roosevelt near Edinburg, which was the site of the first Civilian Conservation Corps camp in the nation. Unfortunately, a friend of Jackie's who was to meet us was never able to find our location. We hope she enjoyed the hike near whichever trail head she ended up! Starting at 10 am we enjoyed a perfect warm and sunny April day in the George Washington National Forest. The Stephens Trail steadily climbed for 4.4 miles until it met the Massanutten Trail allowing us a beautiful vista on the ridge line of Massanutten Mountain another mile. The last push up to Kennedy peak brought us up to an elevation gain of 1,590 feet where we enjoyed our lunch and chocolate chip cookies/chocolate at the tower. As this is also an equestrian trail, we were greeted with horses and riders along the path. Only a few easy stream crossings and mostly easy footing made it for ideal walking. After lunch we descended on the Massanutten Trail back to the parking lot on Rt. 675. We all decided Tuesdays are a great day to hike and we are already scheming for trails to hit in the near future. No, it is not nap time yet, David! Not only did we hike, but we spent much of the day thinking of the 101 ways you can use a trekking pole. This was to convince Scott that they indeed are a trusty tool on the trail from fighting off bears to crossing raging streams to using as a stretching device. At the end of the day we had a new convert. Bill Holman provided a day hike with take home knowledge and giveaways to help hikers deal with the potential dangers associated with tick bites. He provided a hand out with information about tick safety as well as a permethrin spray for clothing that greatly reduces the chances that ticks will get to your skin. With Bill, Iva Gillet and Brad Young already hiking with clothing treated with permethrin, Bill distributed spray bottles of the mixture to all hikers who wanted them, so that they could spray their own clothes and minimize tick bites. For the hike Bill chose a bushwhack to a symmetrical peak that could be seen from the AHS parking lot - Cedar Mountain. A direct approach from the Skyline Drive near Blackrock would result in a 3+ mile out and back hike, with an option of bushwhacking down to the Jones Run Trail and falls, making a 5 mile circuit. The group included first time hiker and recent arrival from Boulder, CO Bill Crane, who was with his niece Jenny Gibbs. Also along for the hike were David Carter, Christine Ballard, Virginia Masterson, Lisa Lampe and the hiking dog Max, as well as John Sinclair. Rounding out the field were John Shannon, Marian Styles, Brian Muszynski, Brad Young and CJ Woodburn. Departing from Blackrock Summit parking, we headed out on an old fire road through the rhododendron forest to Via Gap where the Via Cemetery can be found. After a short break we began the bushwhack part of the hike toward the summit of Cedar Mountain. John Sinclair turned back in order to make an afternoon appointment. Bill led the way, as folks picked their way up the mountain, around veins of rock, under tree branches, climbing through the leaves with no trail. CJ located a rock outcropping and most of us settled in to enjoy the view, taking a break after the climb. Brad, Brian, Bill and John Shannon continued to the top, admired the limited view and then joined the rest of the group at the rock outcrop. We decided to enjoy lunch here, soaking up the 180 degree view of the Blue Ridge to the west. We also feasted on snacks of brownies and lemon pound cake provided by Iva. After lunch, Brad and Brian decided to began a bushwhack from the top of Cedar Mountain to Jones Run Trail for a longer bushwhack and off they went. Meanwhile, Bill led the rest of the group back toward the Via Gap which was when the tail end of the group encountered an unanticipated side trip. While Bill H, Bill C, John, and Marian returned via a direct bushwhack, the rest of the group drifted off that route. While carefully working on the descent, dodging rocks, roots, branches, and steep footing, the tail end of the group worked their way too far west. The group convened and sweep Iva pulled out her smart phone with the new to her PATC SNP trails app. However, she has never been trusting of such devices. It indicated their location to be off track, but using visual sightings of a grassy, green strip in front of them at the base of Cedar Mountain, she suggested they descend to what HAD to be where they needed to go to meet the others, despite the GPS indication that it was not the correct spot on the map. Knowing electronic devices can be evil and lie (as computers are known to do), there were no worries, since the grassy field matched where they assembled prior to the ascent. It was then that Marian called Iva on her cell to see where the rest of the group was. Iva assured her that they were on the way down. While the cell service was erratic, no matter, as the group approached the corner of the woods and grass. However, the building there was NOT the one they had departed from… so at last Iva relented to go with the direction indicated by the GPS. The woods here was much more overgrown and denser than had been on the climb, causing for even slower travel and several scratches. Everyone slogged on admirably grateful for a beautiful day, despite being clearly off course. 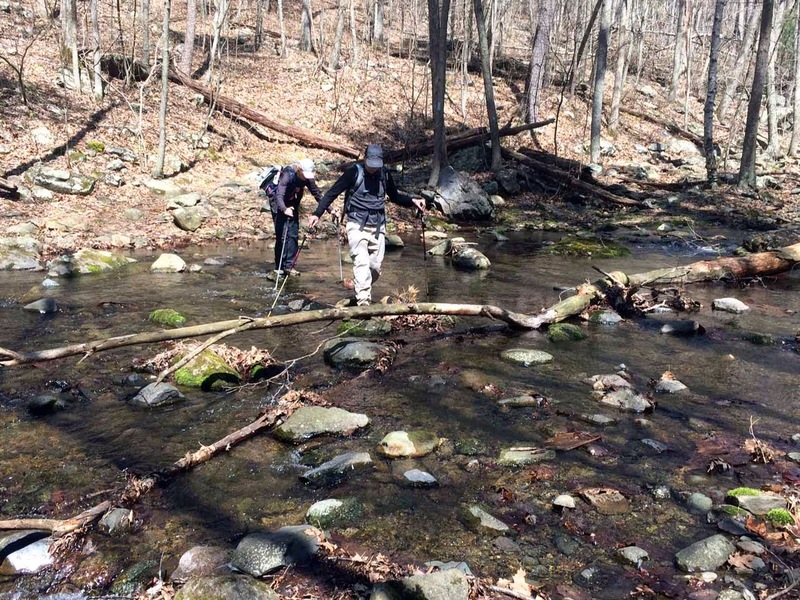 Finally crossing a small stream, the group walked along the woodline in the grass, making travel much easier. At this point, hike leader Bill was trying to contact his wayward sweep Iva by using a whistle, since the cell phone service was inadequate. Following the sound back to the cemetery at Via Gap, the groups were again reunited. It just shows how boring it can be to take the direct route, since they had to wait close to an hour for the rest to join them. After another snack/lunch break and treating the bleeding wounds from the briars, the entire group decided to forego another bushwhack to Jones Run and head directly to Blue Mountain Brewery for some sustenance. Poor Brian and Brad would much later find the group there, after waiting at the falls and finally giving up, returning to their car. * We all love being in the SNP enjoying a group hiking adventure! When the trail maintenance team got up to the Shenandoah National Park it was sleeting, but fortunately it subsided and the rain held off until our projects were done and hike completed. We spent three hours on the Appalachian Trail along the section from Turk Gap to Crimora Lake Overlook. Co-overseers, Marit Anderson and Jeff Monroe, were joined by C. Hunter Cloud, Jason Suckow, and John Shannon. Mark Gatewood, Deputy District Manager SNP South District AT, helped direct the installation of a check dam with a black locust log he had dropped near the trail head earlier in the week and also spearheaded the re-route of section of the trail, which had migrated downhill quite a bit. Water bar cleaning and some regrade was also done. At 1 pm we stopped for lunch and chocolate chip cookies. We got to chat with a number of section and thru-hikers who appreciated our work and the countless volunteers on the trail. After tools were reloaded in Mark's truck and various cars, the trio of Jason, John, and Marit did a speed hike to the top of Turk Mountain and made it back just before the clouds opened up. Good job team! Lead by Dan Ralston (out) and Kelly O’Rourke (back) the hike was attended by Jeanne Densmore, Leon Gorman, Susanna Williams, Brad Young and Dave Borszich. We enjoyed a beautiful hike along Jeremy’s run which starts out ~13 miles north on Skyline Drive from the Sperryville/Thorton Gap entrance. We had about 14 (but whose counting?) wide stream crossings and only got out about 4.3 miles. The stream crossing slowed us down a bit because of the high water and we had to turnaround due to time. The hike was about 8.6 miles round trip. A great hike enjoyed by all! The Rivanna Outdoor Gear and Film Festival (ROGaFF) was Sunday, March 29th, 2015 at Fluvanna County High School in Palmyra Virginia. It featured vendors of outdoor equipment, paddle sports, bikes and the Charlottesville Chapter of the PATC to help attendees with advice and gear for the upcoming outdoor season. A feature film The Appalachian Trail: An American Legacy was shown. Other short films featuring biking and paddle sports were also shown. Andy Willgruber led a hike through the very nice Pleasant Grove Park. Thanks to Briana Taylor and Andy for getting together, setting up and working the PATC display for the festival. The calendar said, "Spring." The wind and freezing temperatures said, "Not yet!" Despite these conditions, seven hardy souls showed up at Albemarle High School to assist A.T. trail maintainers Lindsay Brown and Andy Willgruber. They included Hunter Cloud and six shivering members of the Virginia Environmental Law Forum (the environmental law student group at UVA Law School): Brandy Allen, Olivia Glasscock, Matt Schneider, Meredith Westerlund, Will Grossenbacher and Jacob Aronson. Jacob is a PATC member and former trail overseer of a one-mile section of the Western Ridge Trail of Rock Creek Park. The decision was quickly made for Hunter to join Lindsay in doing some vegetation cutback on his A.T. section at Riprap (Lindsay reported a chilly but successful day of lopping). The UVA group would go back for more layers of clothing and meet Andy at Rockfish Gap. Although Andy had called The Shenandoah National Park road closure line that morning, he became a little concerned while driving through a snow squall on his way west on I-64. He became more concerned when he saw the Blue Ridge Parkway was closed at Rockfish Gap. However, he was relieved to find the friendly face of Ranger Mooney at the south entrance station, albeit with a winter road hazard sign placed next to her booth. She cheerfully waved our three-car caravan through, and we arrived at Beagle Gap shortly thereafter. Andy sent his group north on the A.T. with tools to clear any minor trail obstructions on their way up to Little Calf Mt. summit. He would drive up an access road and meet them there. After rendezvousing within seconds of each other and admiring the grand view at the summit, the crew commenced the primary work of the day. The task was to install the four remaining 6x6 blaze signposts north of the Little Calf summit on the open grassy areas of the trails. This would complete the signage on the relocated section of A.T. over Little Calf Mt. The group grabbed the various tools that had been cached a few days before and received instructions. They took turns and excavated with pick, shovels, digging bar and post-hole digger. Truthfully, it was the only way to stay warm! Andy had advertised the day as a combined work day and hike, but the six wanted to remain on task. They safely and steadily dug, installed and plumbed the post and re-packed dirt and rock around it. After completing three post installations, we stopped for a quick lunch in a sunny spot in the old apple orchard section of the trail. After lunch, we installed the final double-blaze post where the relocated trail rejoined the original at the south end of the old orchard. Painting the posts would have to wait for a warmer day. With the job completed, this group of Cavaliers was ready to return home. They all expressed an interest in continuing this partnership with PATC, possibly twice a year. Andy handed each of this intrepid group a souvenir map of the Stony Man/Skyland section of SNP and sent them back down the trail to Beagle Gap. Andy would remain for tool collection and cleaning. Many thanks to the Virginia Environmental Law School Forum for this day. The Charlottesville Chapter was lucky to have them!